All payments are due prior to or upon pickup. All invoice incur a 2% finance charge per 30 days overdue. Check, Cash, and all major credit cards are accepted. Please examine our proof critically. We are human and do make mistakes. Please check names, numbers, spellings, punctuation, and other general layout items. We need your help to do the job correctly the first time and save you the expense of reprinting a job due to an error that you fail to correct now. Custom Silkscreen Orders of 12+ must submit a half down deposit when size order is submitted to ensure due date is reached. Small Custom Orders Less than 12 shirts shall pay in full at time of order – no exceptions! Organizations submitting a Purchase Order through a school or other affiliation shall not require deposit but must supply PO at time of order to VSGA. Approved Orders: Once orders are approved size counts can be added to but not cancelled. Custom apparel: It is extremely important that you review and approve custom monogram, text, artwork or imagery. Venezie Sporting Goods will print your custom product EXACTLY as it is approved. It is the customer’s responsibility to review and approve the customization, as Venezie Sporting Goods does not allow returns/refunds/credits on custom apparel. Custom apparel is final sale! Defects on apparel: Venezie Sporting Goods checks apparel for defects before printing. Please double check your apparel for defects once you receive the apparel. If a defect in the apparel is found, you have 10 business days to bring the defected apparel back to Venezie Sporting Goods for a replacement. Online Store Creation – First 15 items will be listed on the store free of charge, each item beyond 15 will incur a $10 setup fee. Online Store Order Requirements – 12 item order minimum – per logo/design, per size range (Adult/Youth). A $10 fee will be charged for each item fewer than a quantity of 12 sold. We are not able to modify your store after it has opened (only spelling and pricing discrepancies can be corrected). Design or Logo Limit – We limit 2 Logos per store. If you wish to have more than that, we charge a $50 setup fee for any logos beyond the 2 logo limit. There will be NO open or close date adjustments once the store has been opened. This is to assure that those ordering are getting the items in the timeframe promised. Embroidery Logos may incur a $50 One Time Digitizing Fee. Deposits are refundable in the event no fees are added. They will be reimbursed in the form of a check or if paid with a credit card, they will be put back on the card in which it was paid with. If there are fees incorporated they will be taken out of the deposit. By placing an order with Venezie Sporting Goods & Apparel you are agreeing to the following terms & conditions. PROOFS: The price quoted for each job includes two edits per design. Additional design edits and modifications incur additional $10.00 editing fees per edit. (This does not include spelling errors.) We will not print until we receive an artwork proof approval either physically with a signature or electronically by responding to a proof email. REPRINTS: Any reprints will be at the expense of the customer. Standard reprint fees start at $10.00 plus cost of shirt. Reprint fees will not be charged if the order meets our quantity minimum of 12+ pieces. LEAD TIMES: Standard lead time is 10 business days after artwork proof and/or apparel approval. Online apparel sale lead time 14 business days after store closes. Please note that our lead time may occasionally be affected by circumstances outside our control such as equipment malfunctions or back-ordered or unavailable materials. We will contact you immediately if there is any anticipated problems. ORDER ADD-ONS: Further Add-ons to original order after the order has been placed may incur an additional shipping charge as well as reprint fee to meet due date requirements. LESS THAN MINIMUM FEE: Our quantity minimum is 12 shirts to silkscreen, should you place a new order and require less than the quantity minimum a $25.00 fee will incur. CARRY-IN APPAREL: If you choose to bring in your own apparel to be printed, we cannot guarantee the apparel quality and will not replace defective carry in apparel. By approving your invoice you are taking a risk that if something happens, we do not replace the apparel. We are only responsible for the logo being printed. RUSH FEE: If your order requires a lead time of less than 7 business days, a $25.00 fee will be assessed. If you order is required in less than 5 business days, a $50 fee will be assessed. Screen printing ink swatch is available to review at our store. This swatch shows our in-house ink colors and is a customers best tool to visually see an ink color and match with apparel colors. Below is the digital version of the ink swatch sheet – this digital file may or may not represent the colors in their best output as many screen resolutions display photos differently. 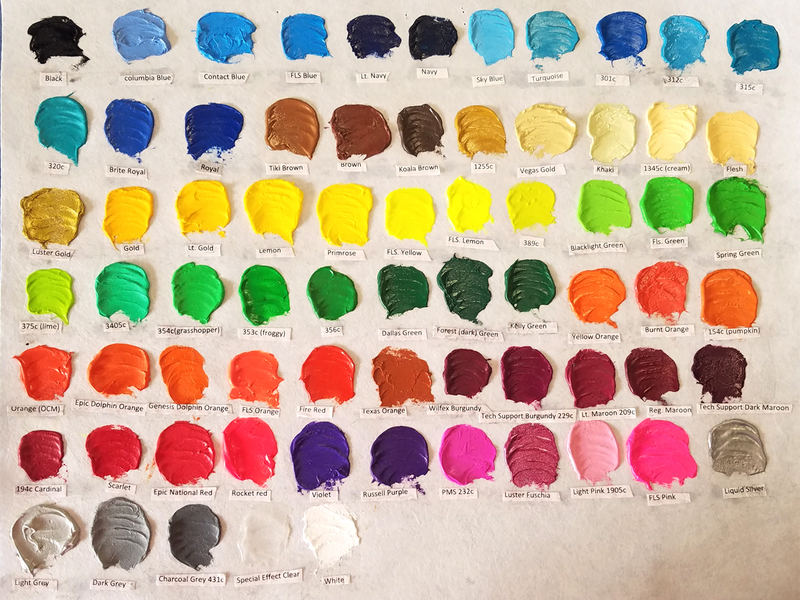 Please review the ink swatch in person, in our store for best representation of colors available.